Not all Christmas trees are the same. It’s only once a year we have to think about it, but getting the right Christmas tree isn’t just an art, it’s a horticultural science and there are many varieties of Christmas tree to choose from. Traditionally, Picea abies) or the Norway Spruce has been the go to Christmas tree for most families at Christmas. It’s major drawback though is that it sheds its needles and can start to look a tad shabby not long after Christmas day. Increasingly people are looking to different varieties to provide greater longevity and some of the non-needle shedding varieties. Fraser fir (Abies fraseri) has a different type of pine needle having soft, wide and flat dark green needles rather than short light green fine needles. 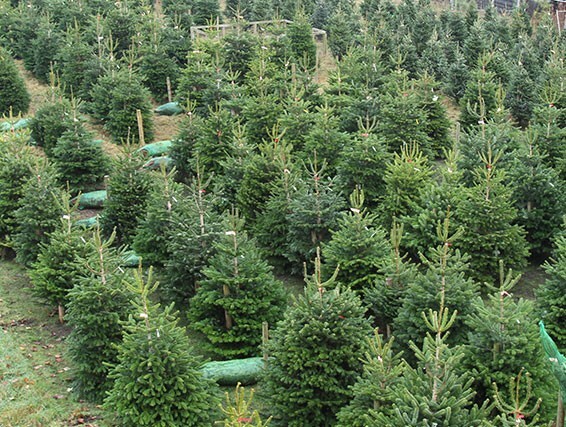 Native to the Appalachian mountains, this Fraser fir is the perfect Christmas holiday tree. Named after John Fraser, a Scottish explorer, and botanist it is uniformly pyramid and can reach 80 feet. Being monecious, male and female flowers occur on the same tree. It is a beautiful tree for Christmas with it’s bluey green waxy pine needles which don’t shed. The Nordmann fir or (Abies nordmanniana) is one of the bestselling Christmas trees in the UK most likely because it retains its needles It also has soft glossy foliage which means it’s pet and child friendly. Native to Russia, it’s species is sustainable and it makes for a popular choice for Christmas tree because of it’s beauty and symmetry. Regardless of what tree you plump for this Christmas, make sure you keep it well watered and keep it outside in the cool for as long as you can before you bring it in and decorate it. Choosing one of the trees which doesn’t shed, whilst more expensive, will definitely prove worthwhile if you want your tree looking its best for longer. Here at Aztec we can help you with choice and installation.